Kamaole Sands is a first rate property, located directly across from Kamaole Beach Park 3 and offers a beautiful garden area with pool, jacuzzis, children's wading pool, tennis courts, and extensive garden areas with BBQ sites. It truly is a perfect place to vacation. We take pride in our units and keep them extremely clean, upgraded, and in great working order. Our units are first rate and appointed with luxury furnishings. We would love to welcome you 'home' to Maui. Please send us an e-mail. Aloha! West Maui Mountain view from living room and lanai and Haleakala view from lanai. Fully stocked. We even have cookibng oils, saran wrap, condiments, and a spice rack! Amazing location and great price! Beautiful condo, tons of space. Lanai faces the ocean, wonderful views. Kamaole Sands resort is lovely, great location close to shops and beaches. Charley and Michelle are accommodating, easy to get in touch with. This condo is very well priced as well, especially for the size. Would highly recommend. Stocked with everything we needed for the stay. Condo was a great fit for our family of 4! We had everything we needed to make our stay feel like home away from home. We have stayed at Kamaole Sands many times and this unit was by for the best in which we've ever stayed. The condo was so clean, there was absolutely everything we needed right down to salt and pepper and the owners were so friendly. The condo feels like home the minute you walk in and the view is lovely. We can't wait to come back again. Gorgeous well appointed and super clean condo. The owners are lovely. We stayed at this condo and loved everything about it. The unit is beautifully decorated, has everything you need right down to a spice rack, is super clean and has a great ocean view. There are beach chairs, an umbrella and cooler to use at the beach. The complex is lovely with gas BBQs, a beautiful pool area, hot tubs, fitness room, tennis courts and one of the best beaches in Kihei is just across the street. I shopped around a lot and the price is amazing. We can't wait to stay here again. 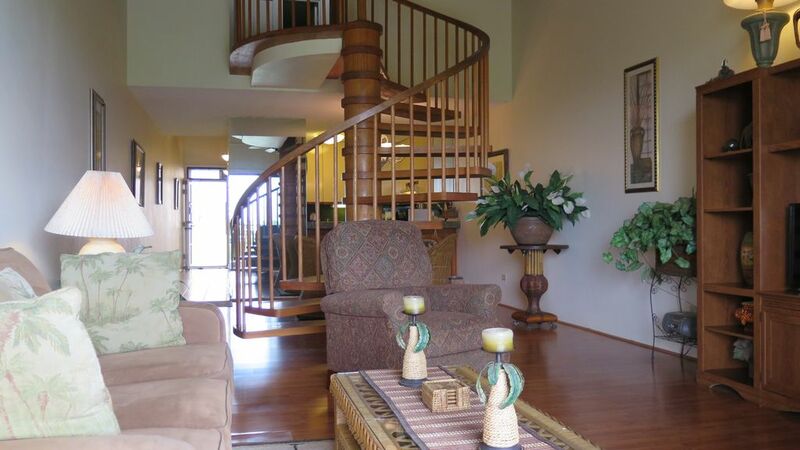 Our stay at Kamole Sands was quite comfortable, the condo had everything that suited our needs. One other thing about the condo, the beds were super comfy. It also as convienient and minutes walking to the Beach. Although you do need a car to get around for other excursions ..